Expedition 43 crew members (from left) Samantha Cristoforetti, Anton Shkaplerov and Terry Virts are pictured at the Gagarin Cosmonaut Training Center in Star City, Russia in October 2014. NASA Television coverage is again underway for today’s homecoming of International Space Station Commander Terry Virts of NASA and Flight Engineers Samantha Cristoforetti of ESA (European Space Agency) and Anton Shkaplerov of Roscosmos. 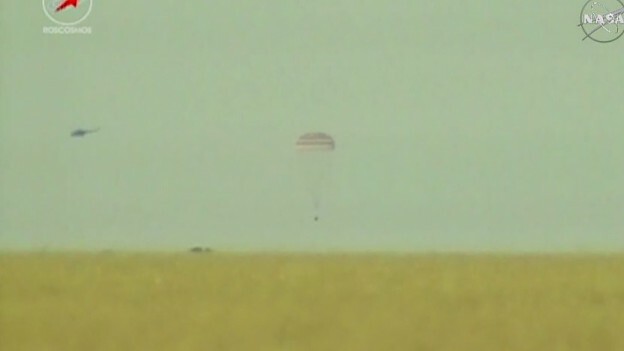 The crew undocked from the station at 6:20 a.m. EDT, and they are on track for landing in their Soyuz TMA-15M spacecraft at 9:43 a.m., southeast of Dzhezkazgan, Kazakhstan. Watch on NASA TV at https://www.nasa.gov/nasatv. After spending 199 days aboard the International Space Station, Terry Virts, Samantha Cristoforetti and Anton Shkaplerov undocked from the station at 6:20 a.m. EDT to begin their voyage home. Shkaplerov, the Soyuz commander, is at the controls of the Soyuz TMA-15M spacecraft. They will perform a separation burn to increase the distance from the station before executing a 4-minute, 35-second deorbit burn at 8:51 a.m. 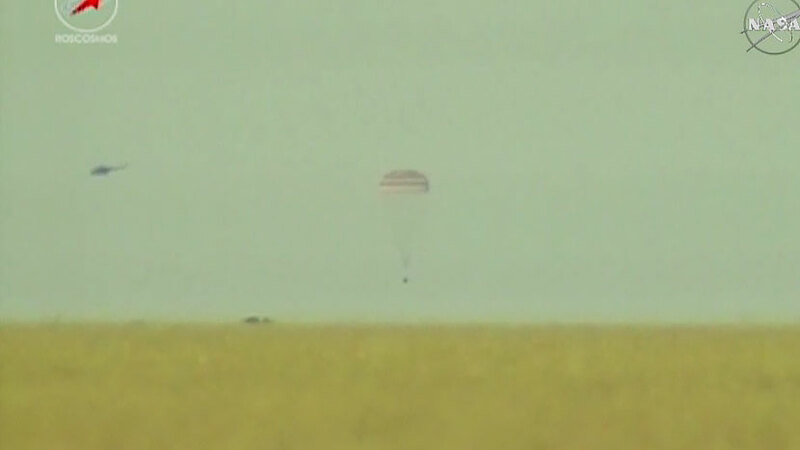 The crew is scheduled to land at 9:43 a.m. southeast of Dzhezkazgan, Kazakhstan. 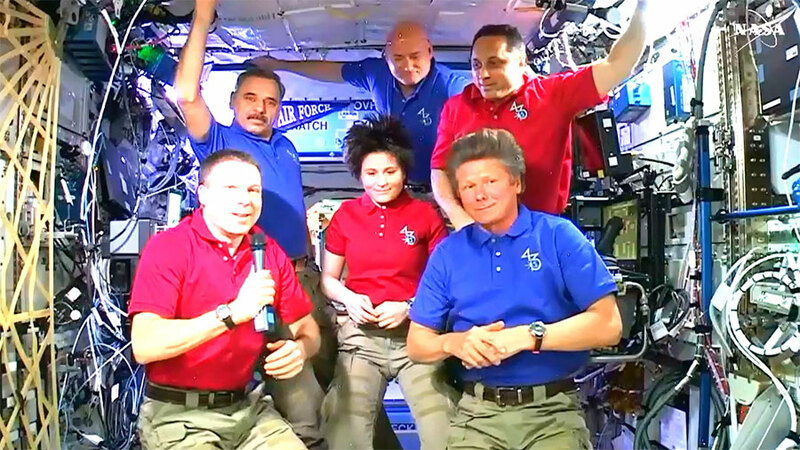 The departure of Virts, Cristoforetti and Shkaplerov marks the end of Expedition 43. The Expedition 44 crew members, Commander Gennady Padalka of the Russian Federal Space Agency (Roscosmos), Scott Kelly of NASA and Mikhail Kornienko of Roscosmos will continue research and maintenance aboard the station and will be joined next month by three additional crew members, NASA astronaut Kjell Lindgren, Russian cosmonaut Oleg Kononenko and Kimiya Yui of the Japan Aerospace Exploration Agency. NASA Television will air live coverage of the Soyuz TMA-15M deorbit burn and landing beginning at 8:30 a.m. at https://www.nasa.gov/nasatv. Here is the timeline for Expedition 43’s landing. Three Expedition 43 crew members are busy preparing for their homecoming during their last full day in space. Commander Terry Virts ceremoniously handed over control of the International Space Station this morning to veteran cosmonaut Gennady Padalka. Virts and Flight Engineers Anton Shkaplerov and Samantha Cristoforetti will end their stay tomorrow at 6:20 a.m. EDT when they undock from the Rassvet module. 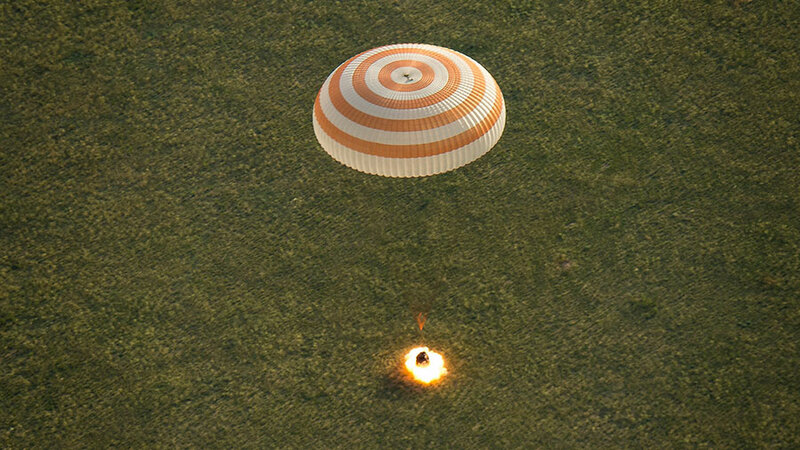 The trio in their Soyuz TMA-15M spacecraft will parachute to a landing in Kazakhstan at 9:43 a.m. after 199 days in space. 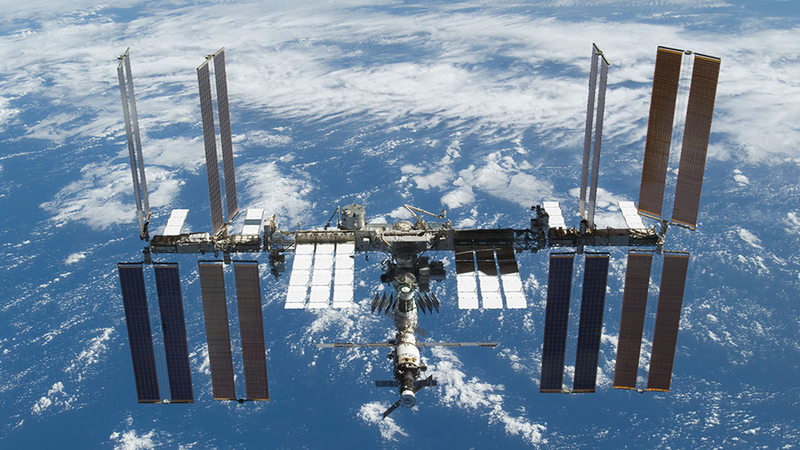 NASA TV will cover the undocking and landing activities live. Science, the main purpose of the space station, is still ongoing today as One-Year crew member Scott Kelly collected his urine and saliva samples for the Twins study. Scientists are comparing his body in weightlessness with his Earth-bound identical twin brother and ex-astronaut Mark Kelly. 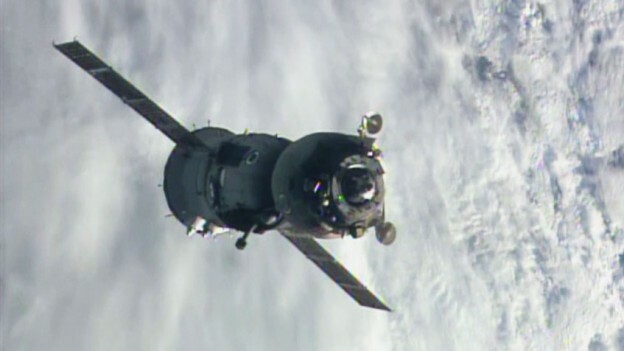 Thrusters on a Soyuz spacecraft inadvertently fired Tuesday morning momentarily changing the station’s orientation. Russian flight controllers quickly corrected the situation and the crew was never in any danger nor is there any impact on the Expedition 43 undocking Thursday morning. S129-E-009326 (25 Nov. 2009) — The International Space Station is seen with parts of the Mediterranean Sea and Africa and Spain in the background. Station managers from Roscosmos have announced new Soyuz and Progress spacecraft launch dates through the end of the year. Meanwhile, the six member Expedition 43 crew on orbit has a packed schedule of homecoming preparations, science and maintenance. Three Soyuz crew missions to the International Space Station have been given new launch dates. The next Soyuz mission carrying three Expedition 44/45 crew members is scheduled sometime between July 23 and 25. A Soyuz taxi flight that will bring up Flight Engineer Sergey Volkov and return Commander Gennady Padalka is scheduled for launch Sept. 1. Volkov will be accompanied by European astronaut Andres Mogensen and a third crew member yet to be announced. 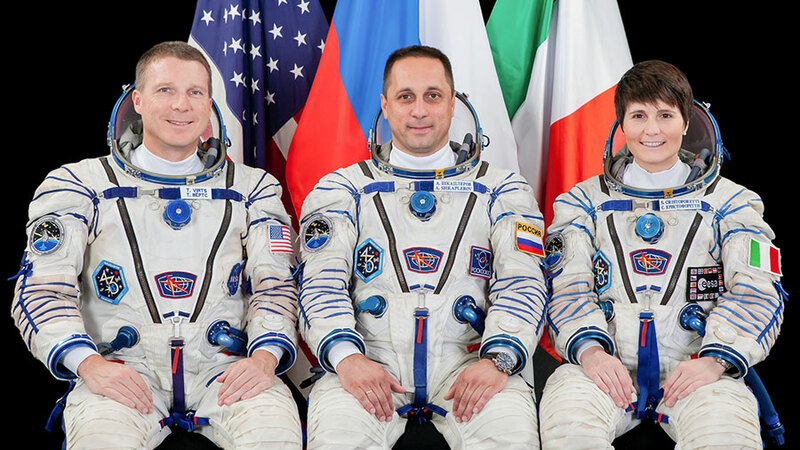 The Expedition 46/47 trio will launch Dec. 15. Three Progress cargo missions were also rescheduled. The first resupply mission is set for July 3 and the next two are planned for Sept. 21 and Nov. 21. In space, Commander Terry Virts and Flight Engineers Anton Shkaplerov and Samantha Cristoforetti are packing their Soyuz TMA-15M and getting ready for Thursday’s undocking and landing. 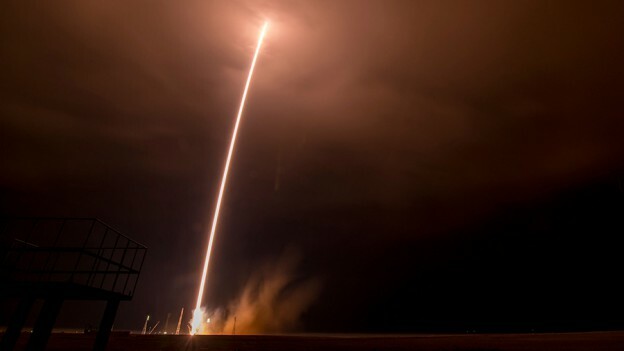 The homebound trio will undock at 6:20 a.m. EDT and land in Kazakhstan at 9:43 a.m.
A wide array of experiment work that observes how humans adapt to living in space took place Tuesday. 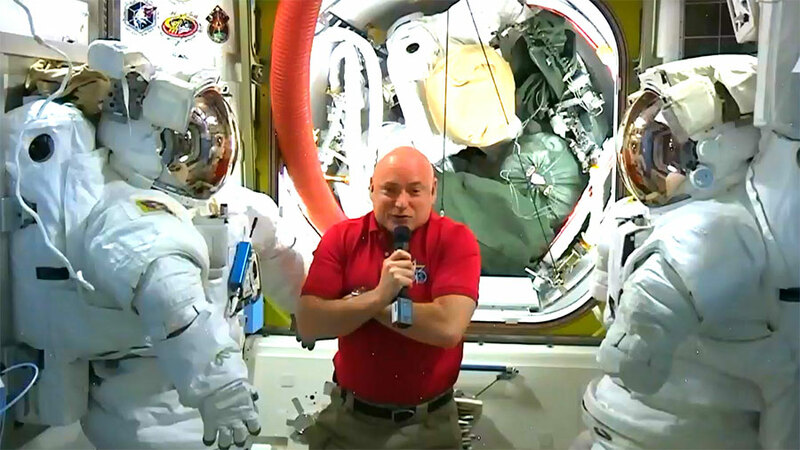 One-Year crew member Scott Kelly collected his saliva and blood samples for the Twins study. Scientists are comparing his body in weightlessness with his Earth-bound identical twin brother and ex-astronaut Mark Kelly. The crew prepared for ultrasound scans so they could explore cardiovascular health before, during and after a space mission for the Cardio Ox study. The crew also studied how astronauts operate and repair interactive, touch-based and sensitive technologies in space for the Fine Motor Skills study. 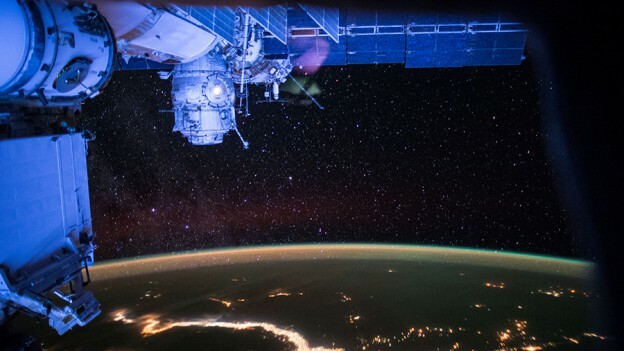 ISS043E218074 (05/18/2015) — This night view from the International Space Station on May 18, 2015 gives a view of brilliant city lights on the Earth’s surface shining beneath thousands of stars above. The thin line of Earth’s atmosphere can be seen with the green glow of aurora along the outer edge. Playing it conservatively, International Space Station flight controllers conducted a pre-determined avoidance maneuver (PDAM) today to steer the station well clear of a fragment of a spent Minotaur rocket body launched in 2013. Having tracked the object throughout the weekend and today, U.S. and Russian flight controllers executed a 5 minute, 22 second firing of the ISS Progress 58 thrusters at 2:58 p.m. CDT to slightly raise the station’s orbit and distance it from the fragment that was projected to pass within three statute miles of the complex later in the day. The maneuver raised the station’s altitude by just 106 feet at apogee and 7/10 of a mile at perigee, resulting in an ISS orbit of 254 x 244.8 statute miles. 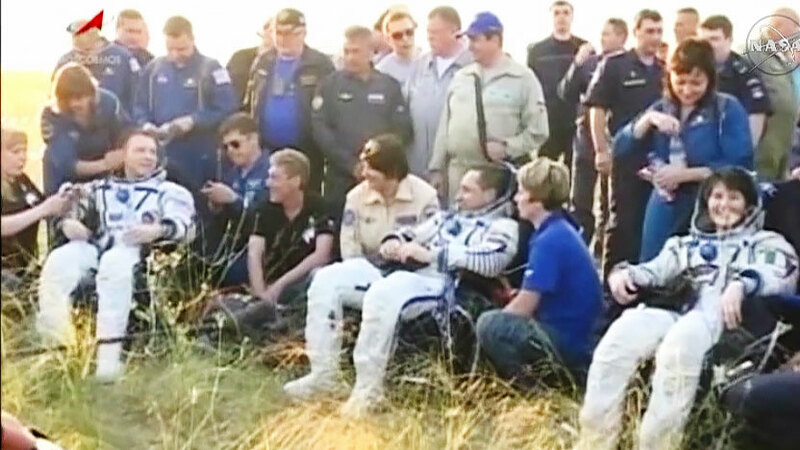 The crew was never in any danger and the maneuver will have no impact on the scheduled landing later this week of Expedition 43 Commander Terry Virts of NASA, Soyuz commander Anton Shkaplerov of the Russian Federal Space Agency (Roscosmos) and Flight Engineer Samantha Cristoforetti of the European Space Agency, who are completing preparations for their return to Earth and a parachute-assisted landing in Kazakhstan in their Soyuz TMA-15M spacecraft at 9:43 a.m. EDT Thursday. 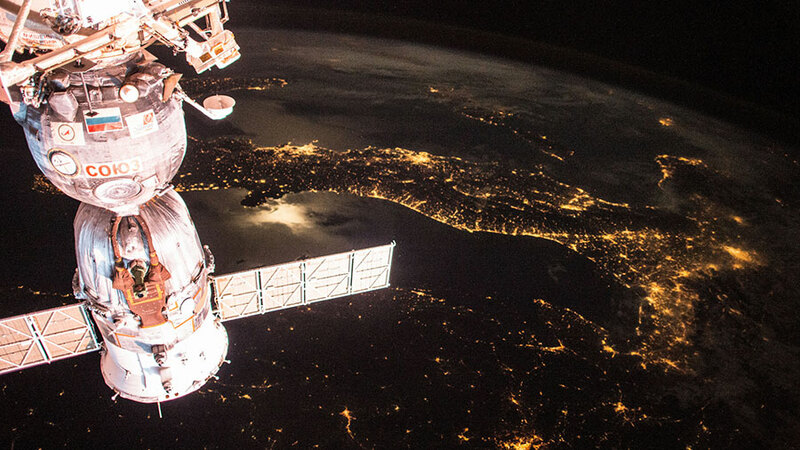 ISS043E271162 (05/29/2015) — This nighttime image from the International Space Station shows the Soyuz TMA-15M which carried NASA astronaut Terry Virts, Russian cosmonaut Anton Shkaplerov and ESA astronaut Samantha Cristoforetti to the station and will return them in early June. A fragment from a spent Minotaur rocket body is being monitored today as flight controllers decide whether or not there will be a conjunction with the International Space Station. A docked ISS Progress 58 cargo craft would fire its engines should the space station need to get out of the way of the space debris. A trio of Expedition 43 crew members will still come home Thursday morning should an avoidance maneuver be necessary. Commander Terry Virts and Flight Engineers Anton Shkaplerov and Samantha Cristoforetti are moving right along with their departure preparations. They trained for their descent through the Earth’s atmosphere and tested the thrusters of their Soyuz TMA-15M spacecraft. Thursday’s undocking is planned for 6:20 a.m. EDT with a landing in Kazakhstan at 9:43 a.m. NASA Television will provide live coverage of the departure and homecoming activities. The latest Expedition 43 trio including Flight Engineer Gennady Padalka and One-Year crew members Scott Kelly and Mikhail Kornienko teamed up to review their roles and responsibilities in case of an emergency.